When we moved from Orange County, we gave away all of our house plants. While I am a horrid gardener, I love plants. Succulents, mostly, because it is hard to kill them off. I hated giving away our plants, as they all had a special meaning for me. There was the succulent that was the first houseplant we bought for our condo in Newport Beach. The basil, oregano, and tomato plants that I used for fresh pasta sauce. The money tree and jade plant that my dad bought for me for my baby shower. The mini cactus garden that Giuseppe brought home for me when we moved to our apartment in Tustin, right before Paolo was born. The aloe plant that my mom gave to me when she came to visit before the baby was born. Since moving to IOWA, we haven’t yet really rebuilt our house plant inventory. It’s not as easy to find succulents here, as they are not native to this climate. I believe that having indoor green plants is very important for the air quality of our living space, so I have started my search for some new house plants. I looked at some local stores over the weekend, but wasn’t able to find anything that I wanted to purchase. I was inspired to start researching on which plants were the best for indoor air purification, and wrote about it this morning on our Angelberry Organics website, here. Our home doesn’t really boast a lot of direct sunlight. The apartment has a lot of natural light, but not exactly direct sunlight. I have found that the best air purifying plants that also do not require direct sunlight seem to be ferns and dracaena. I also really like bamboo and lilies, so I may try those out as well. Hopefully I can keep them alive. It looks like we may have to take a trip to the local gardening center today. As most of you have probably already read, last week I did a guest post exchange with one of my blogisphere friends, Liz, of a belle, a bean & a chicago dog. I thought I would re-post my article from her site today. I started this blog as a cyber scrap book of sorts and I think that this post definitely belongs in the book. A big part of my life the past few years has been the state-hopping Craig and I have been doing. But believe it or not, I happen to have a bloggy friend, Brook, who is even MORE of a gypsy than me. It is in the spirit of relocation that Brook and I are guest posting on each other’s blogs today! Brook also happens to be the first guest writer I’ve had the honor of hosting! Please welcome the lovely Brook, and make sure to relocate over to her place to check out my guest post, A Baby For Every State! Greeting, BB&CD readers! My name is Brook Dell’Anna and I write at baby&sofia. I “met” Liz a few months ago when I started to read her hilarious blog. We since have become blogisphere friends and have bonded over our shared experience of moving about the country. My parents both hail from the Great Midwest. My mother was born and raised in Minnesota; my father is from Iowa. They met at a small Catholic university in Iowa. Not too much longer after that, they were married and I was born. Not too much longer after that, my parents made the decision that they were ready to leave the Great Midwest. It was the mid-1980s and the economy was not doing so hot. After weighing all post-college opportunities, my dad decided to try out his sea legs and joined the Navy. We moved across the country to New England, where Dad completed Officer Candidate School while Mom and I learned our way around Newport, Rhode Island. It’s funny how I can still vividly remember the gorgeous trees that turned into the most brilliant shades of yellow, orange, and red that autumn. From Newport, we moved all over the country for my Dad’s career. We traveled up and down the East Coast, then hopped over to Hawaii, then back to the Mainland to live on the West Coast for awhile before returning back East. I ended up going to college in Maryland, and while I was in college, my family moved to Italy. Which was spectacular. (Did I mention that is where I met my amazing husband?) Joining the Navy ended up being one of the best things that my Dad ever did for our family. When I was in college, I realized that I have gypsy blood. I think now that it must be genetic. My parents are still always looking for their next adventure; after Italy, they moved back to Hawaii, and are now planning the next chapter in their lives. They are usually on the move, looking for a new, exciting experience to add to the history of their lives. As an adult, I have lead a “Navy” lifestyle without ever actually joining. During college, I spent as much time as I could in Europe, passing summer and winter vacations there and taking a semester to study in Rome. Ten days after graduation, with my Political Science degree in hand, I was back in southern Italy ready to take it all in. I loved every minute of the chaos that is Naples and fell deeply in love with my Italian soon-to-be-hubby. After Naples, my husband and I moved to sunny southern California. Which we love love loved. The breezy, sun-shiny days that we spent strolling along the ocean were simply picturesque. While we worked longer hours, we still managed to enjoy every moment of the sun and the ocean. After about two years of California bliss, we decided to move yet again. In March of this year, Giuseppe was offered a position at Iowa State University, so off we went. The movers came and went, and then our road trip began. 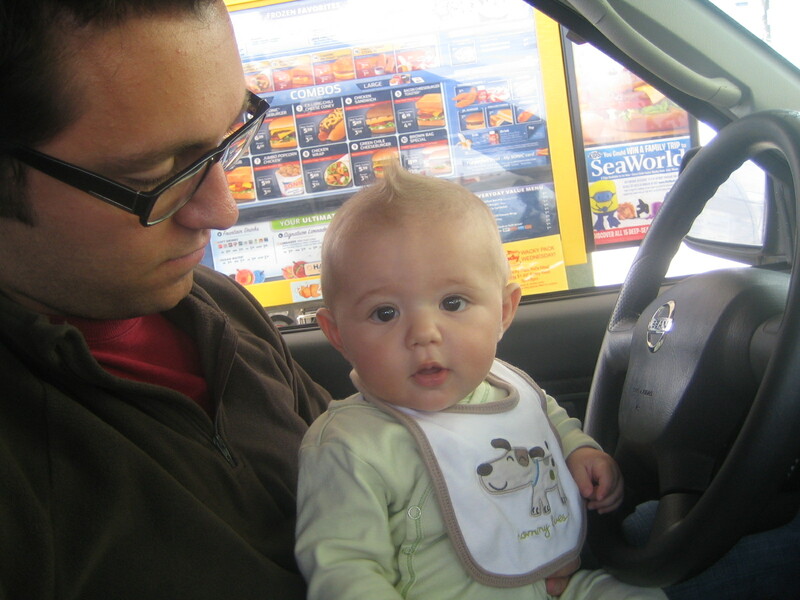 Giuseppe, five-month-old Paolo, and I drove across the country to our new home. It was actually an amazing trip. 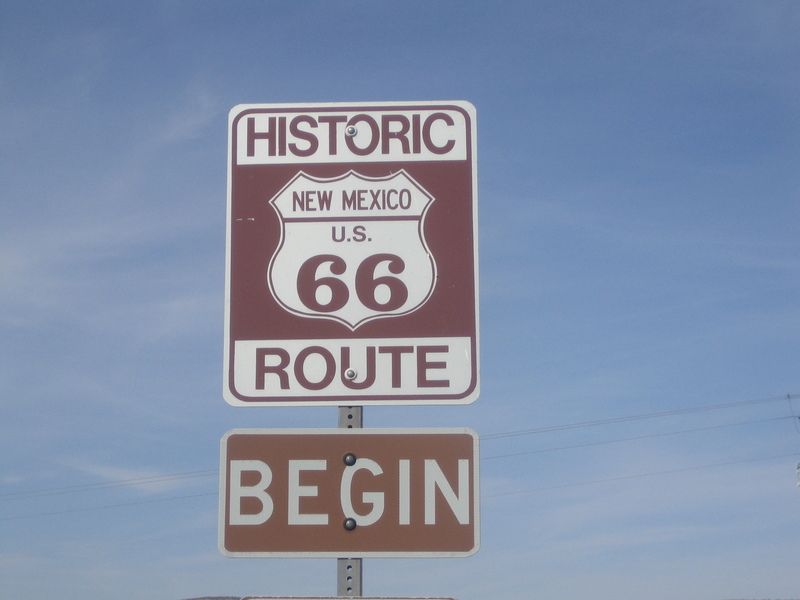 We stopped in Arizona, at the Grand Canyon, Santa Fe, Denver, and Omaha. It was the Great American Road Trip for Italian hub-a-lub. He loved it. So, here we are, modern-day gypsies. I was raised a gypsy, but my husband definitely was not. We’ll call him the gypsy-convert. Most of his family live within 20 minutes of each other, and moving to say, a neighboring city, is a very big deal. (So you can imagine their surprise when we hopped over “the pond” and then over to the Pacific coast of America.) While I do one day envision myself setting down in one place and growing some serious roots, I enjoy every moment of our gypsy adventure. I guess I can thank my parents for that. Hopefully, Paolo will feel the same way one day. I would like to introduce you all to Liz, author of a belle, a bean & a chicago dog and Editor of Our Mommyhood. She and I have decided to guest blog for one another, which means you can find me on her blog today. Enjoy! Greetings, baby&sofia fans! My name is Liz, I write at a belle, a bean & a chicago dog, and I’m a bloggy friend of Brook’s. She and I “met” months ago and have bonded over our penchant for relocation. Now, I haven’t had the international adventures like Brook, but my husband and I made 3 interstate moves over a 5 year period. From Chicago to Memphis, TN…Memphis, TN to Nashua, NH…and Nashua, NH back to Memphis, TN. The name of my blog is actually tied to our relocations. Kate is our Memphis Belle, due to the place of her birth. Madelyn was born when we lived about 40 minutes outside of Boston, making her our Boston Baked Bean. And Jack, our Cockerspaniel, is our hometown boy! Let me just say that never in my wildest dreams did I ever imagine leaving Chicago! And if I would have been asked to list any places where I’d like to move, neither Tennessee nor New Hampshire would have been on my list. Our adventure started off as just the 2 of us, carving out a life together. Craig moved into an outside sales position with his company, and that’s what led us to the Home of the Blues & the Birthplace of Rock N Roll. Neither of us had even visited Memphis before our flight down here to search for a place to live. When you move to a completely new area, you might as well be a tourist. You spend hours researching it on the internet before you depart, you don’t know how to find your way around once you land there, and you’re strangely excited to see stores and restaurants that are the same as where you’ve moving from. Yes, places like Home Depot and Olive Garden gave us the warm and fuzzies. The exhilarating part comes in when you realize it’s just the 2 of you, against the world. It is up to you to make this new place your home, to form a new social circle, to discover your new favorite places to eat and shop, and to make this new town work for you and your new life. But then you go and have kids. And they make things like living 500 miles away from any and all family, that much trickier. That, and future relocations trickier, too. We relocated for the second time when Kate was 15 months old. We moved out of a brand new house we had built… and into a 30-year-old house that was a total gut job. We again started our lives over with friends and doctors and Targets and fabulous Mexican take-out. We learned our way around (Well, by sight. When you move as much as we do, I’ve come to realize there’s no point in learning street names; landmarks will do just fine). 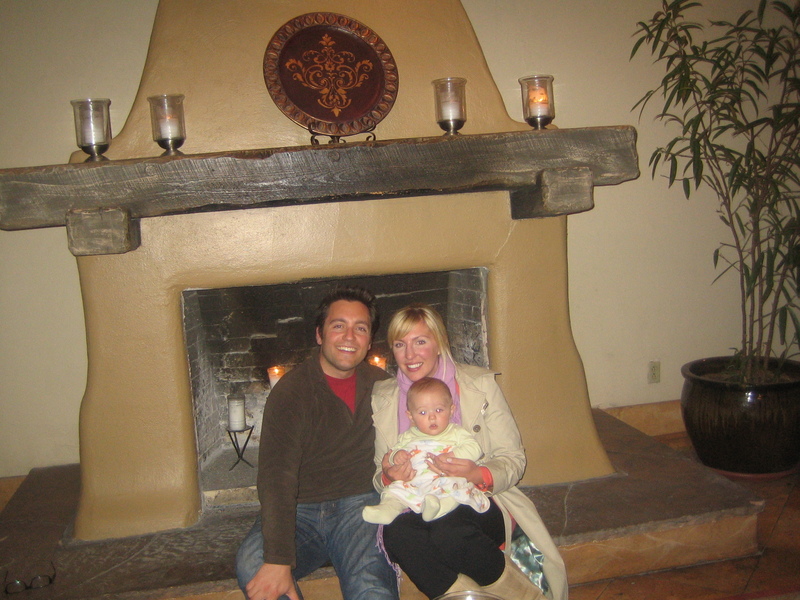 We remodeled a 2,200 sq foot house, got pregnant and had a baby in the 17 months we lived there. With a whole lot of blood, sweat and tears (and LOTS of money) invested, we left our house in NH as a new family of four, and headed back to TN. I was too pregnant to fly when it came time for house hunting, so that meant me giving the OK to Craig to buy our current house sight unseen by me. But the good thing about this relocation was the feeling of ‘coming home’. Chicago will forever be our home, but all the work we did to make friends and find wonderful doctors and learn our way around was not lost with this move. We are happy to be back in familiar surroundings, and building new memories with old friends. It is already well known that I am a HUGE FAN of the Bumbo seat, and last week at Target, I found the most awesome accessory ever. 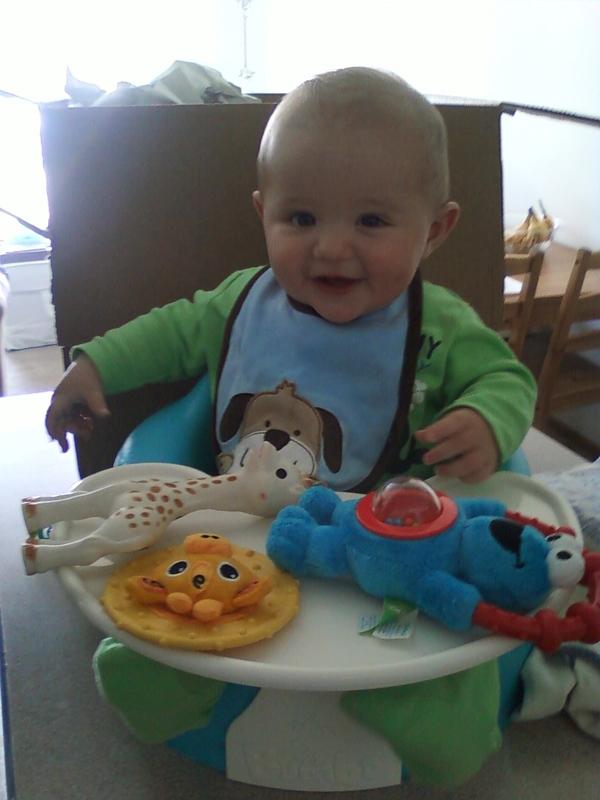 A tray that hooks onto the Bumbo so that Paolo can play with his toys while he’s in the Bumbo. It’s perfect for cooking dinner. Love it. The Bumbo is definitely fantastic, but I am not sure how much longer we’ll need it: Paolo held himself up sitting for the first time on Saturday night! It was the most adorable thing ever; I think that he was more shocked than we were when he stayed sitting up all by himself! He hasn’t done it again since, but I imagine there is more to come very soon! 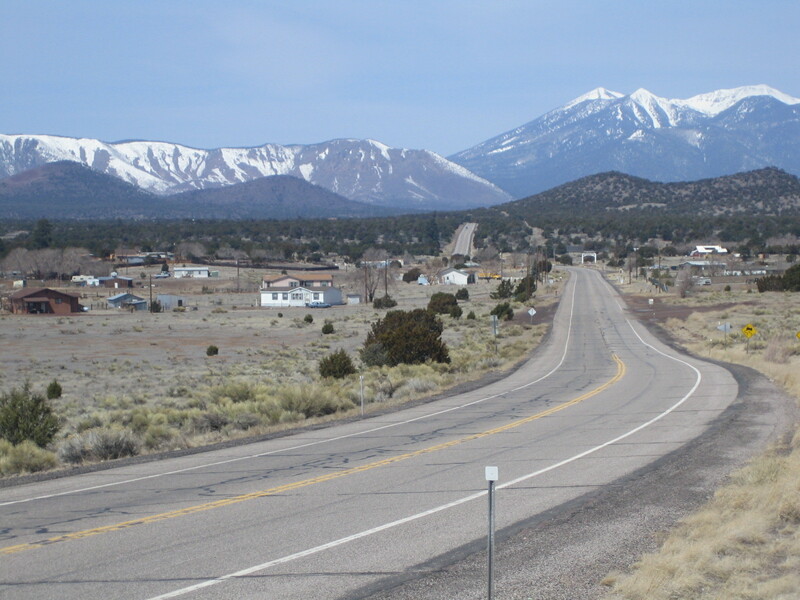 Today we arrived to New Mexico. It is gorgeous here. 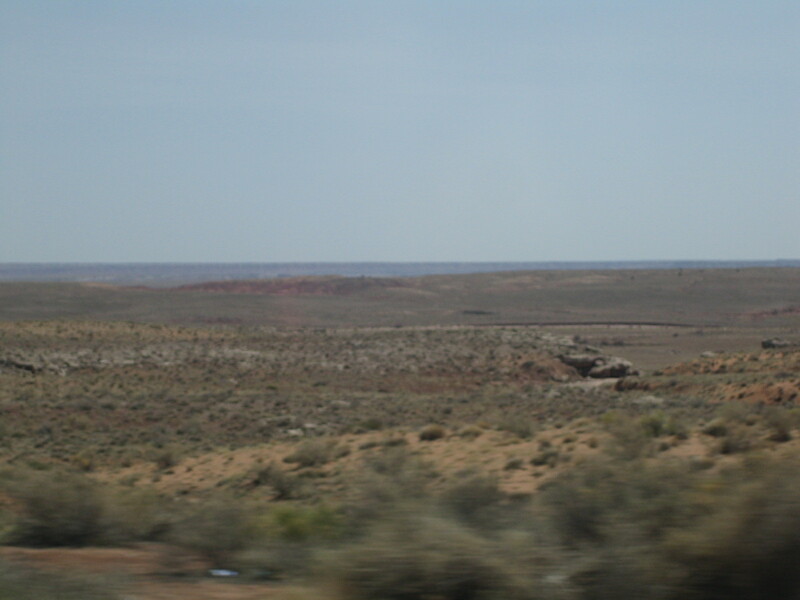 As we drove through western Arizona, the landscape grew more and more desolate; as we traveled further into New Mexico, it improved. 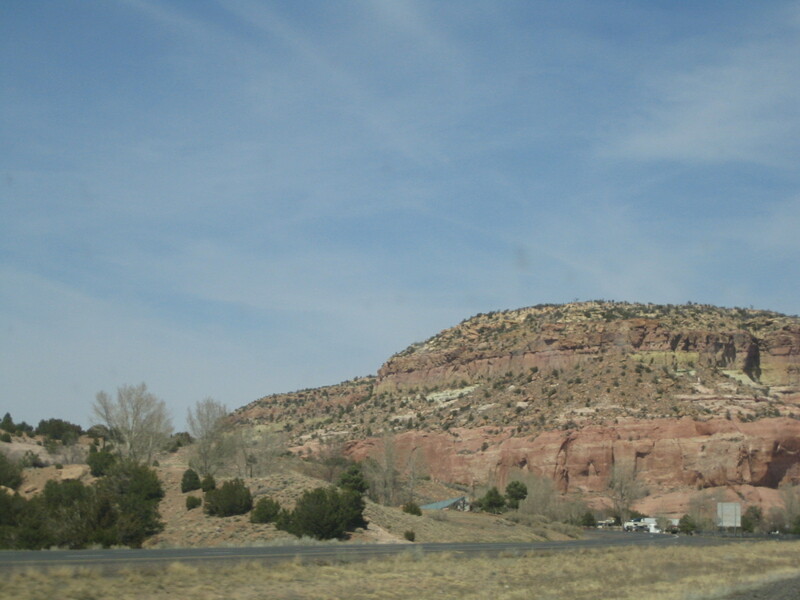 As we drove east, we drove through the Navajo Nation, Apache Country, and countless Indian reservations and pueblos. It was very interesting. Did I mention the landscape was beautiful? 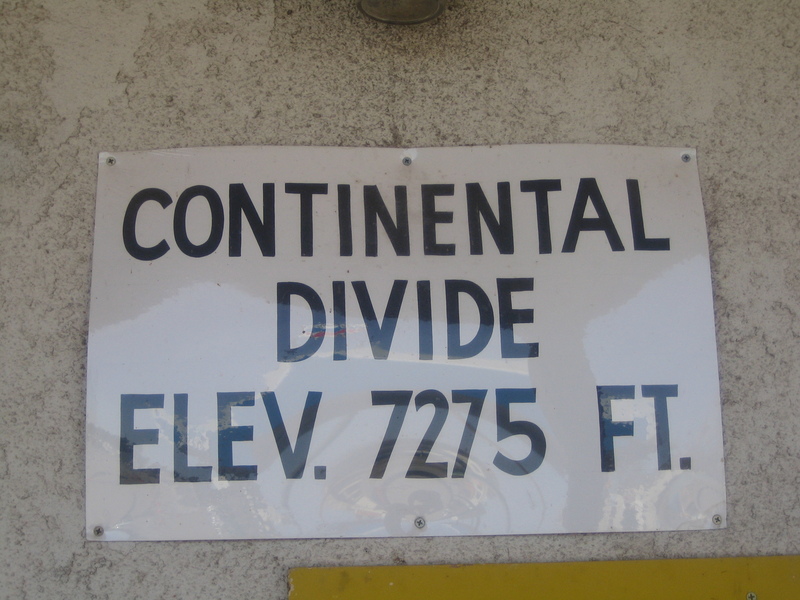 We passed the Continental Divide today, too. We stopped at a little gas station/convenience store/souvenir shop. 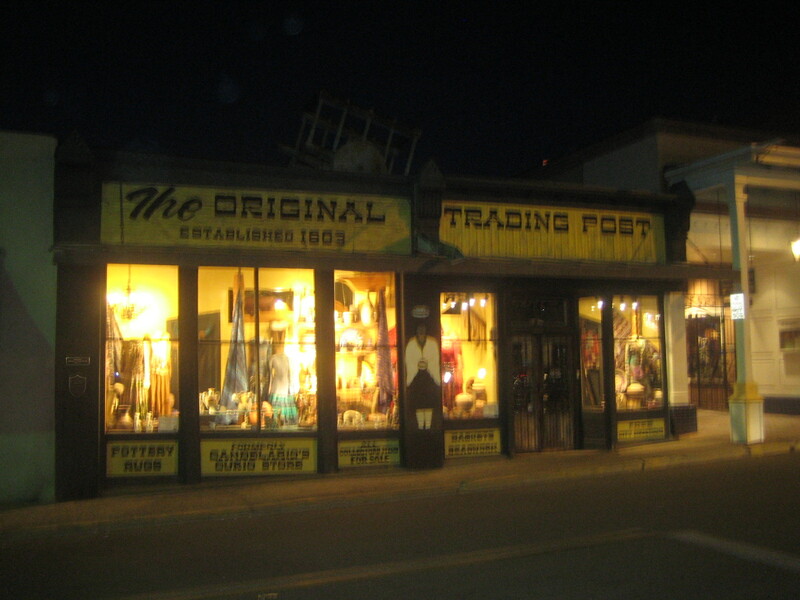 It was filled with American Indian crafts, petrified woods, Route 66 souvenirs, and, of course, Continental Divide souvenirs. I almost bought the most adorable set of mugs with the vintage-y ‘Route 66’ logo on them, but refrained. If I published how expensive it was to move our household goods to IOWA, your jaw would hit your keyboard. So I refrained. And bought a magnet instead. I have started thinking in terms of cost per pound…I mean we will eventually have to move everything back to the West Coast again. And this time I plan to downsize even more and/or find a job that will pay for moving expenses. But I digress. 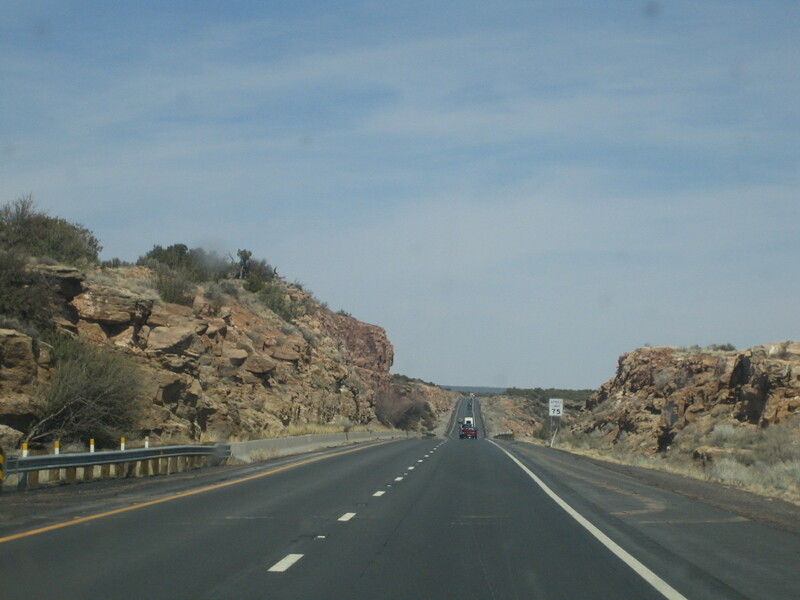 So, from Flagstaff, we drove through the Painted Desert to Albuquerque and then north to Santa Fe. Along the way, Paolo had his first drive-in experience. He wanted some Diet Coke and made chewing movements with his mouth as we ate. It is hilarious how he acts around grown-up food. 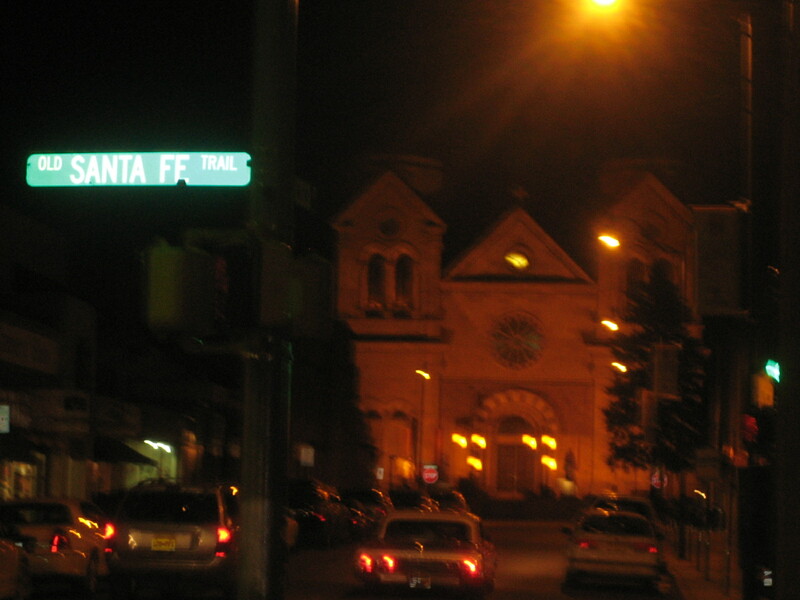 Santa Fe is amazing. Absolutely adorable. I am in love. We are staying right in the historic district. Even the hotel is a historic building. I think it reminds me Europe, with the old buildings and central square surrounded by shops and restaurants. And everything is decorated in a Western style, but very tastefully. 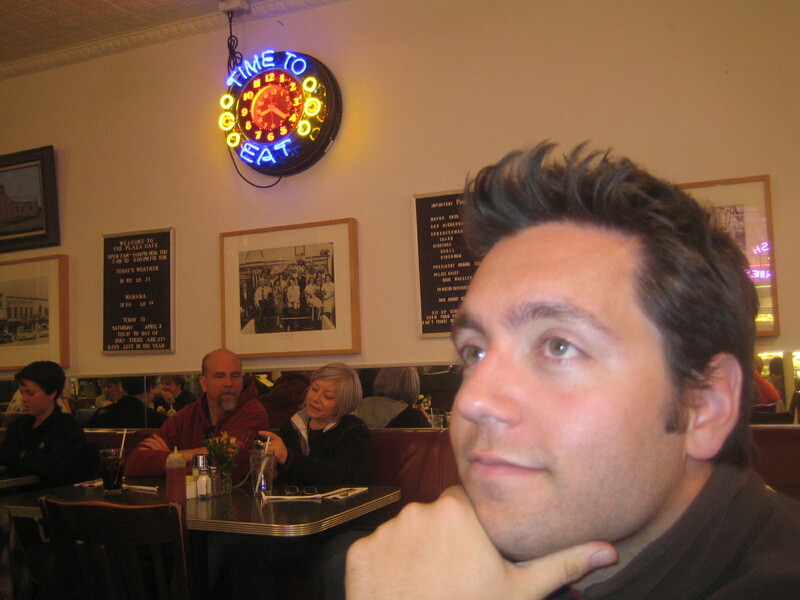 After we checked in, we took a stroll around the downtown and stopped in at a ‘New Mexican Diner.’ Then we strolled around a bit more to stretch our legs before calling it a night. Tomorrow morning is Paolo’s first Easter. And we will be celebrating very unconventionally, without Easter baskets and candy at home. Instead, I think we will sleep in here at the Hilton, then walk to downtown Santa Fe and have coffee and pastries in the plaza. Next stop: Denver.